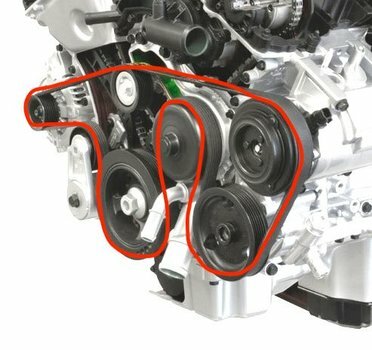 Replace the Serpentine Belt on a Dodge Charger with the 3.6L Pentastar v6. 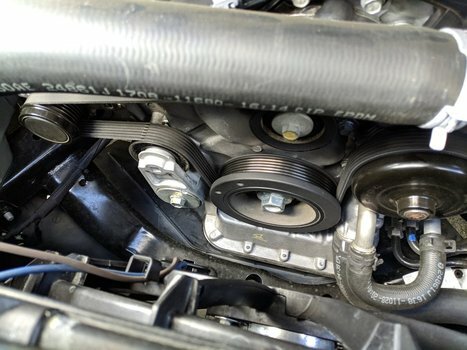 This article also applies to the Dodge Challenger, Dodge Avenger, Dodge Durango, Jeep Grand Cherokee, Chrysler 300, Chrysler 200 and any Ram 1500 with the 3.6L v6. The tensioner uses a 3/8" drive square adapter without a socket. Here I'm using my 1/2" drive with a 3/8" downsizing adapter. Simply rotate the tensioner using the same direction you'd loosen a bolt. 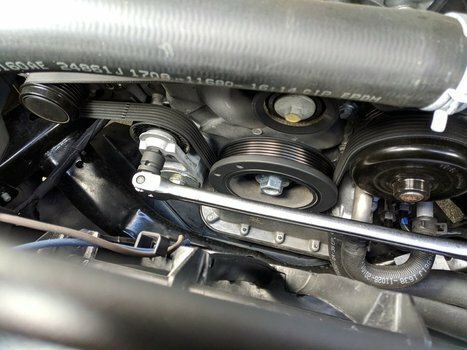 Doing this will rotate the entire tensioner and loosen the belt enough to slip it over the alternator pulley on the left. Once there's enough slack in the belt, simply remove it by unraveling it from the various pulleys. Begin installing the new belt by wrapping it around a pulley and routing it as indicated in the image below. 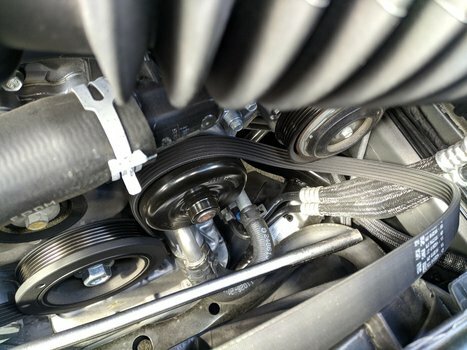 Holding the belt in place, use your breaker bar to loosen the tensioner enough to allow you to slip the belt over the alternator. Double check alignment of the belt on all the pulleys. Pay particular attention to all pulleys where the ribbed side rides against the pulley.